On October 21, 1978, President Jimmy Carter signed into law the Boundary Waters Canoe Area Wilderness Act. Sigurd Olson, who attended Northland College from 1916-18, had a lifelong relationship with the Boundary Waters, celebrating his honeymoon there in 1921, guiding numerous trips on its waters, living and raising his family near its borders in Ely, writing about it in magazine articles and his celebrated collections of essays, and advocating for its protection on numerous occasions. 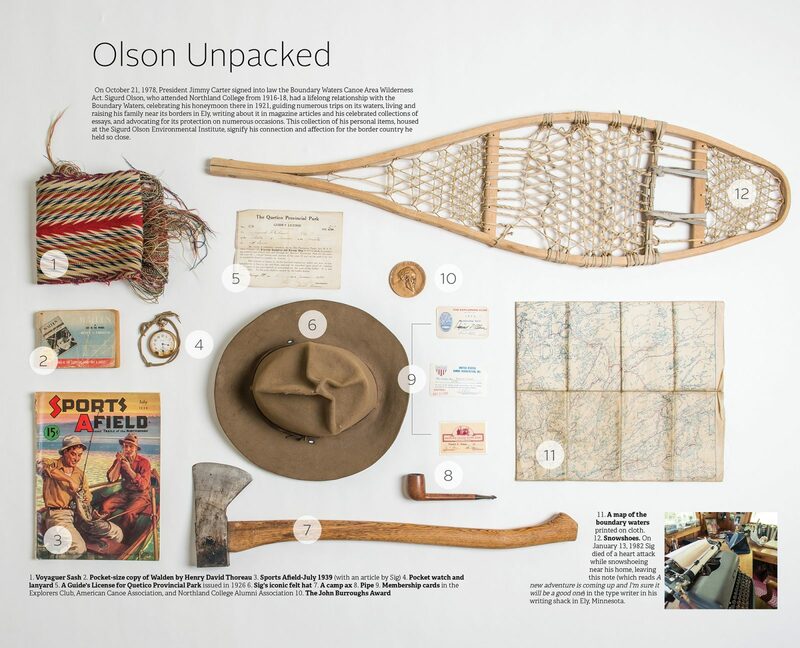 This collection of his personal items, housed at the Sigurd Olson Environmental Institute, signifies his connection and affection for the border country he held so close. Pocket-size copy of Walden by Henry David Thoreau. Sports Afield, July 1939 (with an article by Sig). A 1926 guide’s license for Quetico Provincial Park. Sig’s iconic felt hat worn on paddling trips throughout the border country. Membership cards in the Explorers Club, American Canoe Association, and Northland College Alumni Association. A map of the Boundary Waters printed on cloth.